Often there is more than research inside the books we read. Bookmarks, train tickets, receipts, and menus tucked into pages offer clues about the life of the book itself. Yet the lives of our research material often go unmarked, lost between the gaps in disciplinary boundaries and narrow definitions. The biographies of books and documents can illuminate their contexts, as printed matter that is sold, passed down or abandoned. What happens when we consider the three moments of production, transmission, and reception together with our own research stories? Documents, like people, have births, lives, and even deaths, so what does it mean to investigate the biographies of texts, objects, and archival records? Beyond the formal roles of cataloguing and archiving, what part do researchers play in shaping the emergent archive? This is not strictly an intellectual history, nor even a material book history, but something more like a social history of ideas, inspired by work such as Antoinette Burton’s discussions of Archive Stories (Duke University Press, 2005), Arlette Farge’s reflection on the Allure of the Archives (Yale University Press, 2013), Lisa Jardine’s discussion of Temptation in the Archives (UCL Press, 2015), and Ann Laura Stoler’s call to read Along the Archival Grain (Princeton University Press, 2009). Indeed, the stories of our research material evolve significantly over their life cycles, as Arjun Appadurai outlined in The Social Life of Things (Cambridge University Press, 1986). Beyond commodities and value, however, this workshop seeks to consider our affective relationship with research material, juxtaposing critical histories with reflections on practice. Has the life cycle of a book, document or object helped develop its context for you? Has the course of your research been shaped by encountering ‘serendipity in the archive’? We will look to publish material in four themes, though this conference is focussed on the idea of Research Stories. We are encouraging a focus on research stories to invite a more reflective methodology, offering a more inclusive and engaged commentary on the work involved in researching, ordering, and preserving the past. Please send in proposals of a maximum of 250 words for papers of 15-20 minutes (although we are open to accommodating shorter papers). Please also attach a short CV or biographical presentation, of no more than 1 page. All are welcome! 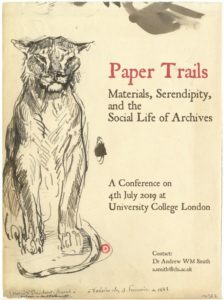 Proposals should be sent to papertrailsconference@gmail.com by 5pm on 24th May 2019. This conference is scheduled for 4th July 2019, to take place at University College London in partnership with UCL Special Collections and Archives. We are endeavouring to ensure that our venue is fully accessible to encourage broad participation. Please direct any questions to Dr Andrew WM Smith (University of Chichester) – a.smith@chi.ac.uk. Prev Let’s Talk About Precarity (4/4) What’s in a name?